Jerry Greene R.Ph., FACA, Founder & Director of San Diego Compounding Pharmacy, has been a practicing compounding pharmacist in San Diego for 20 years. He received his undergraduate degree from Western Michigan University before attaining his pharmacy degree at the University Of The Pacific. San Diego Compounding Pharmacy, family owned and operated, is a culmination of traditional pharmacy practice combined with "today's technology". In the past it was known as an apothecary, but today compounding pharmacies have grown into a special place that caters to each individual. In every medical practice there are patients who have not responded to traditional treatment or who have a unique need or medical circumstance. These patients can be helped. We work together with patient and practitioner to provide the best solution for each medication problem. The possibilities are endless. Not only can we prepare common dosage forms--solutions, suspensions, suppositories, creams, and capsules, our team of professionals can compound a wide variety of "specialty" items to meet you or your patient's special needs. Perhaps your specialty needs include medications made without sugar or lactose, or you need gluten free, wheat free, preservative free formulas, San Diego Compounding Pharmacy will formulate it for you. San Diego Compounding Pharmacy specializes in Hormone Replacement Therapy (HRT). These Hormones are derived from plants (phytoestrogens) and are synthesized into the exact molecular structure found in the human body. Because they are an exact replica of our own hormones, they become an exact fit into our hormone receptors. This is especially beneficial for not only treatment but also to negate side-effects commonly seen in synthetic hormones. Greene's work with these hormones is mentioned in Suzanne Somers' books "AGELESS" and "BREAKTHROUGH". Other specialties are Pain Management, Erectile Dysfunction, as well as a full line of Anti-aging facial and body creams. In an effort to make filling and re-filling your prescriptions as effortless as possible, San Diego Compounding Pharmacy can deliver your medication directly to you via the USPS or UPS. 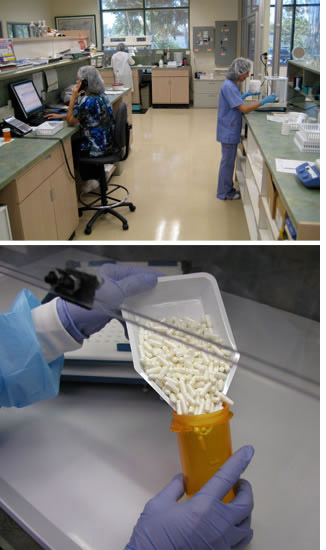 At San Diego Compounding Pharmacy there is no one size fits all when it comes to your medication. We offer solutions to your problems. "I have followed Jerry from place to place since we were in training many years ago. I am told that I am one of the most prolific prescribers of his consistently prepared Bio-Identical hormone medications. My patients are very happy with the timely preparation and direct home or office delivery of their prescriptions. Jerry and his capable staff are always accessible to my patients for general information and to answer any specific questions they may have. The excellent customer service at San Diego Compounding Pharmacy fits perfectly with my solo gyn practice." "Jerry and his crew at San Diego Compounding Pharmacy have proven to my patients and I that there still are great people in the medical profession that have compassion, reliability and professionalism. SDCP is an A++ in my book..."
"SDCP provides a level of service that my patients find superior. The pharmacists are very knowledgeable and are always happy to help. Their knowledge of compounded medications allows me to tailor my treatments to my patient?s exact needs. Their compounded products are of the highest quality. They are a great pharmacy."